We invite you to learn more about this award. 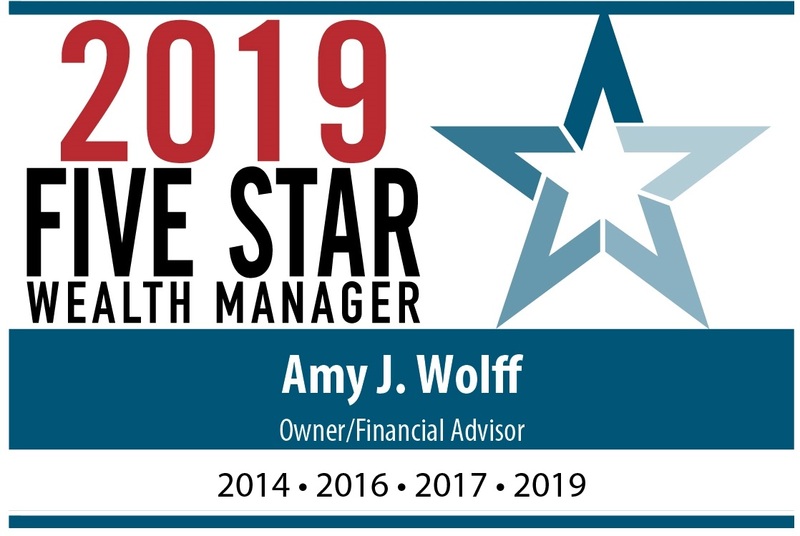 *The Five Star Wealth Manager award, administered by Crescendo Business Services, LLC (dba Five Star Professional), is based on 10 objective criteria. Eligibility criteria - required: 1. Credentialed as a registered investment adviser or a registered investment adviser representative; 2. Actively registered as a registered investment adviser or as a principal of a registered investment adviser firm for a minimum of 5 years; 3. Favorable regulatory and complaint history review (As defined by Five Star Professional, the wealth manager has not: A. Been subject to a regulatory action that resulted in a registration being suspended or revoked, or payment of a fine; B. Had more than a total of three settled or pending complaints filed against them and/or a total of five settled, pending, dismissed or denied complaints with any regulatory authority or Five Star Professional's consumer complaint process. Unfavorable feedback may have been discovered through a check of complaints registered with a regulatory authority or complaints registered through Five Star Professional's consumer complaint process; feedback may not be representative of any one client's experience; C. Individually contributed to a financial settlement of a customer complaint; D. Filed for personal bankruptcy within the past 11 years; E. Been terminated from a financial services firm within the past 11 years; F. Been convicted of a felony); 4. Fulfilled their firm review based on internal standards; 5. Accepting new clients. Evaluation criteria - considered: 6. One-year client retention rate; 7. Five-year client retention rate; 8. Non-institutional discretionary and/or non-discretionary client assets administered; 9. Number of client households served; 10. Education and professional designations. Wealth managers do not pay a fee to be considered or placed on the final list of Five Star Wealth managers. Award does not evaluate quality of services provided to clients. Working with a Five Star Wealth Manager does not ensure that a client or prospective client will experience a higher level of performance or results. The inclusion of a wealth manager on the Five Star Wealth Manager Award list should not be construed as an endorsement of the wealth manager by any client nor are they representative of any one client's evaluation. The Five Star award is not indicative of the wealth manager's future performance. Working with a Five Star Wealth Manager or any wealth manager is no guarantee as to future investment success nor is there any guarantee that the selected wealth managers will be awarded this accomplishment by Five Star Professional in the future. For more information on the Five Star award and the research/selection methodology, go to fivestarprofessional.com. Listing in this publication and/or award is not a guarantee of future investment success. This recognition should not be construed as an endorsement of the advisor by any client. Amy lends her expertise to the Collaborative Law Institute (CLI) of Minnesota with blogs on a variety of topics, including finances and divorce. AJW Financial is on Facebook! You can find AJW Financial on Facebook! On our page you will find the personal stories of our firm, our team and our families – so you may get to know the people and values that shape AJW. There are employee spotlights, photos and quotes that inspire us, as well as upcoming events, financial and lifestyle tips. We invite you to follow us at Facebook.com/AJWFinancial to see what we are up to.